(3 reviews) Write a review! The JCR DL550 Stand bag is made with 100% Dobby Nylon. It features six-way air mesh cushioned full length dividers and also has 10 pockets to store everything from golf balls to valuables. 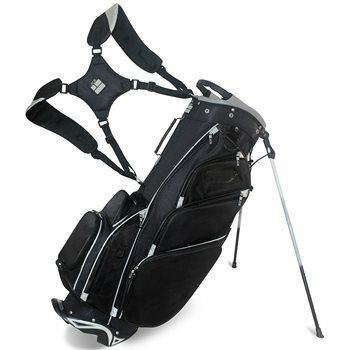 It is a great lightweight bag that can be carried in your everyday round of golf. Aside from negatives mentioned from other reviewers. Padding on dividers wears away & comes apart leading to damaged shafts. Also straps are starting to tear. Shame because there is a lot to like about the bag, but the substandard quality leading to damaged grips & shafts is my warning. I like the 10 pockets and the cell phone access and the reasonable price. The bag is really light and has good assortment of pockets. I feel like the legs could open a bit further to ensure it won't fall over. It hasn't but it doesn't open as far as my Ping stand bag. The other issue is where the strap attaches to the bag on the body side (lower spot). The nylon rubs against the body while walking and it appears to be fraying just a little bit. I would have liked to see that strap connection a little more re-enforced. The top connections look solid. I like the simple look (no big logos).